signage/billboards (ongoing series) | Abler. Representing disability is a challenge; representing cognitive or developmental disability may be more so. Here’s an image from a series of bulletin boards, created in late 2007 by the NYU Child Study Center. 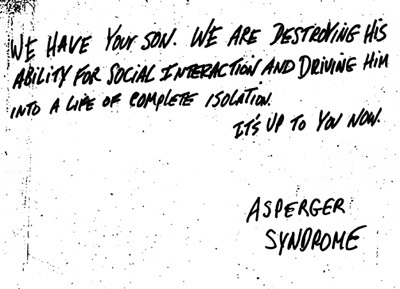 Designed as ransom notes, they were created as a public awareness campaign about various childhood neurological conditions, including the autism spectrum. But the dramatic presentation, and the perceived negativity in their description of these conditions, backfired immediately. 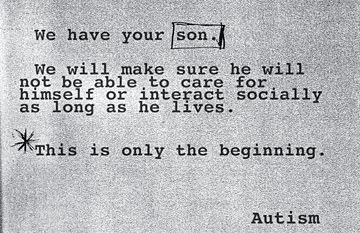 The outcry from autism advocacy groups was swift and loud; the conflict was sufficient to produce articles in the New York Times, the Washington Post, and the Wall Street Journal. The boards were pulled in less than three weeks of their debut. Here’s a chronicle of the entire debacle. I keep thinking about how one would create an awareness campaign that more people would get behind. My friend Jennifer Olson, an L.A. museum educator, and I are working on a proposal for a curatorial project: to collect existing images of disability from all over the world, and to commission new images that better represent self-advocates and their own ideas about disabledness—what it is, and what it isn’t. We’d ultimately like to build a collection that would go to the Center for the Study of Political Graphics, also in Los Angeles, for future study and use. Email me if you come across suitable images! *Loved* that Taxonomy Fail. And I like your suggestions too. I’ll show you some of the cool existing stuff we’ve found as well.